SUDBURY, ONTARIO – April 10, 2018 – Manitou Gold Inc. (TSX-V: MTU) (the “Company” or “Manitou”) is pleased to announce receipt of metallurgical test work designed to provide indications of expected gold recoveries at its Kenwest property located approximately 50 km South of Dryden, Ontario. Following the receipt of the initial surface bulk sample results, in which Manitou recovered 6.5 g/t gold over a trench length of 12.1 m (see press release dated February 13, 2018), the Company requested SGS Minerals to prepare a representative 100 kg composite, for metallurgical testing at the SGS Lakefield laboratory. The preparation of the composite sample was undertaken directly by SGS, in their secure facilities. The metallurgical test work focused on the amenability of a bulk sample to gravity separation and cyanide leaching. The test work was also used to confirm the head grade of the sample. The bulk sample was ground to 80% passing through a 103 micron screen and used for a single gravity separation and bulk cyanidation test. The gravity gold recovery from the Knelson concentrate was measured at 88.6%, which is considered to be a very high recovery level in a simple gravity circuit. The gravity tailing sample responded well to cyanidation using standard conditions, with the 48-hour leach extraction testing returning 95.1% recovery. The overall gravity, plus cyanidation gold recovery, was accordingly, very high at 99.4% for the composite sample. SGS also reports that the calculated head grade of the 100 kg composite sample was 8.9 g/t gold. This contrasts with the expected 6.5 g/t head grade previously obtained from prior testing of the bulk sample by SGS. This contrast suggests that additional bulk sample testing will be required to establish reliable grades for the Kenwest gold mineralization as we advance the property. Cyanide (NaCN) and lime (CaO) consumptions were both 0.79 kg/t. 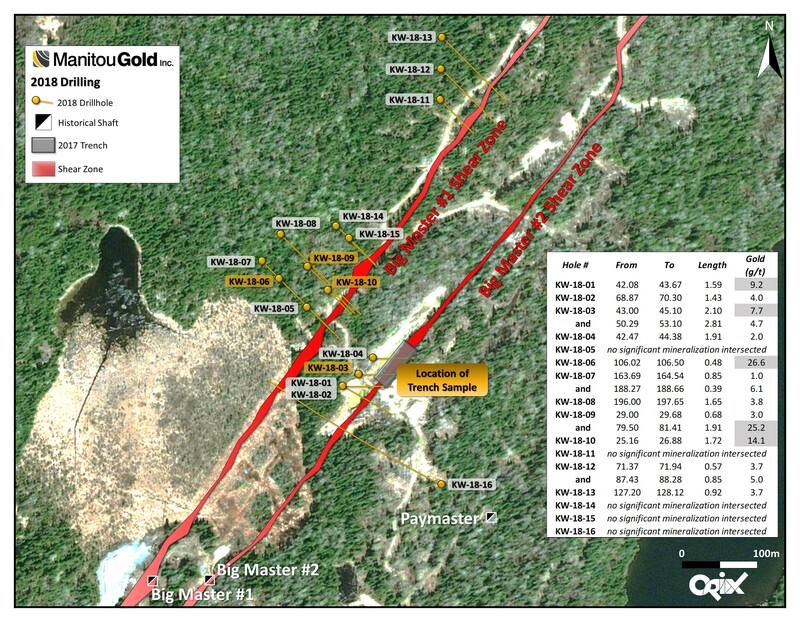 A map illustrating the bulk sample location can be found on the Manitou Gold website. Manitou is currently preparing a new 3-D model of the project geology and mineralization in order to develop plans for the next round of exploration drilling. At the same time, the Company is preparing documentation required for permitting an underground bulk sample at Kenwest. A single 100 kg gravity separation test was completed to evaluate the recovery of gold, as well as to provide gravity separation tailing for downstream cyanide leaching. Ore charges (10 kg) were ground in a laboratory rod mill at 65% solids for a set time to reach the target grind size P80 of approximately 105 μm. The ground material was processed through a Knelson MD-3 laboratory concentrator operating under standard lab conditions. The Knelson concentrate was recovered and assayed to extinction for gold. The Knelson tailing was forwarded for cyanidation. The gravity (Knelson) tailing from test G-1 was submitted for a 48-hour cyanidation test to investigate the response of the sample to cyanide leaching. A 200 L drum was used for the test which was equipped with an overhead mixer, baffles, and air injection. Air was sparged into the pulp at a rate of ~13 L/min to maintain a dissolved oxygen (DO) concentration of 5-8 mg/L. Solution subsamples were not taken during the test. Upon completion of the test, a subsample of the pulp was pumped from the bulk test and filtered, with the final solution being collected and submitted for gold analysis. The filter cake was washed with water, dried, and assayed for gold (triplicate 30 g cuts by fire assay). A subsample of the residue was also submitted for particle size analysis to confirm the grind size P80.